To be honest I wasn’t thinking of increasing their test scores with the development of graphs from data. I ran out of paper and ink one day and needed an alternative way for them to analyze information from a science experiment. I started with ordinary computer paper and a ruler. I walked them through the process of creating a bar graph. It took most of the class period. I didn’t think much of it apart from a simple exercise with students. The second time around it was easier for them to create a bar chart because they understood the fundamentals. I think they really liked coloring in the chart. Being the elementary school teacher that I am I promptly posted them in the hall. I continued to create charts with students from bar graphs to line graphs. I also tackled circle charts when they understood percentages. It provided a great opportunity to reinforce the concept of percentage in a graphic format. The year came and went. The state assessment came and went too. That summer I was given the class results for the state assessment. My class scored a little better than last year in math. It wasn’t until we took a closer look at the scores the following year. It was part of what we did as a national Blue Ribbon school. I noticed that most students answered every question dealing with charts correct. I was no dummy I thought this was something attributable to randomness or the specific class for that year. Each year’s class is different. No two are exactly alike. It was the class not me! I proceeded to continue to manually create charts with students. I thought might prove to help them do better on assessments. I wanted to see the evidence for myself during the year. I developed a series of formative and summative assessments that included graphs and tables. I threw some of the hardest questions I could at them and they sailed through them with ease. Came the next state assessment and I received the same pattern of success. Their scores were perfect when it cam to questions dealing with table and chart information. Cool, I kept doing it every year and their test scores were always top notch. The key lay in their understanding of how charts were created. They were able to make connections to the numbers that were represented in the graphics. They learned how data was collected and how it was represented by tables and charts. Their understanding of how circle charts are developed lean to another unintended result. Their scores on questions related to percentages went up too. They understood how percentages related to the whole. They understood how percentages were derived from totaling and dividing to form the circle graph. Students began to understand how rounding worked. It was a domino effect. To getter a better result for percentages and circle graphs they needed to understand how rounding affected the slices in the circle graph. This style of teaching formed my methodology for years to come. I like to introduce fundamentals and layer on those fundamentals. I like to bring in other content and mix it into each layer. Thus, each layer is more complex without the complexity getting in the way of understanding the concepts. We will be using Google Sheets to develop our bar graphs. 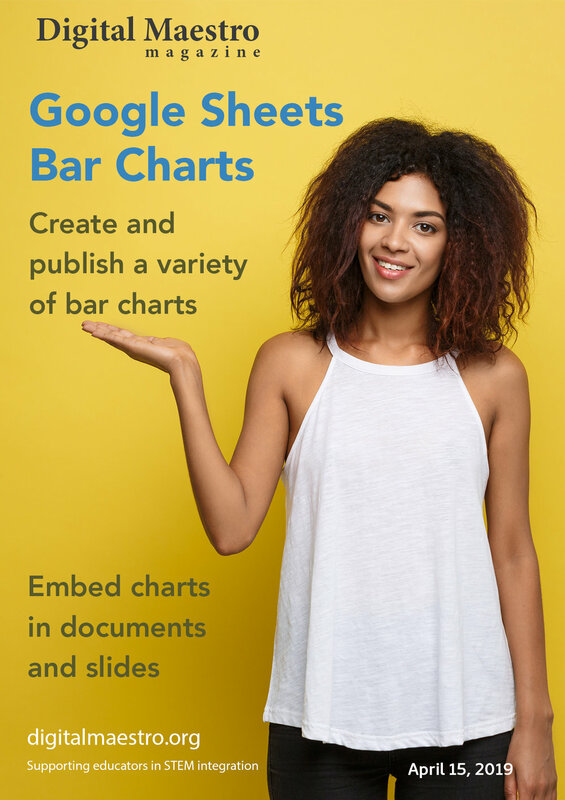 I’m using Google Sheets because it is used across the G-Suite of applications to develop graphs. Docs, Slides, and Drawings reference Google Sheets to render graphs. The process for creating graphs in Excel and Numbers is similar. Those applications are a little fancier. That’s great but it can be a drawback when were trying to get students to develop their projects. There are too many tools and they get in the way. Students spend too much time fidgeting with settings like fonts and colors. Bar graphs are used to compare groups of information. Bar graphs compare groups of data at one point in time or across time. They are very good at comparing data that spans long intervals of time. These intervals are usually months or years. Our first graph compares the number of teachers in each grade level for elementary campuses. These graphs will be a snapshot in one survey to be used for comparison in future survey results. The data for this chart is shared with you on my website. The link is at the bottom of the blog post for this issue. There are several links to this issue. Click on a link to make a copy and follow along. Google documents are publishable in a variety of formats. The same holds true for our spreadsheets and the charts from those spreadsheets. The method used for publishing these documents depends on the audience and your needs too. Published charts retain their connection to the original data. This means we don’t have to republish a chart if the data changes or if we choose to reformat the existing chart. The live connection to data has important applications when collecting data and using Google Forms. The charts themselves can be published on their own or as part of a larger organization of information. We will explore the publication of these charts in Google Documents, Slides, and Sites. I prefer to share charts in sites because it provides a location to display a variety of charts without the need to send out separate links to each chart. I will create a site for the distribution of tables and charts from a survey taken by teachers. I won’t go into the process of creating a site in this lesson but I hope to create a fundamentals site issue in the future. The link to the site with the embedded charts for these examples is available below.